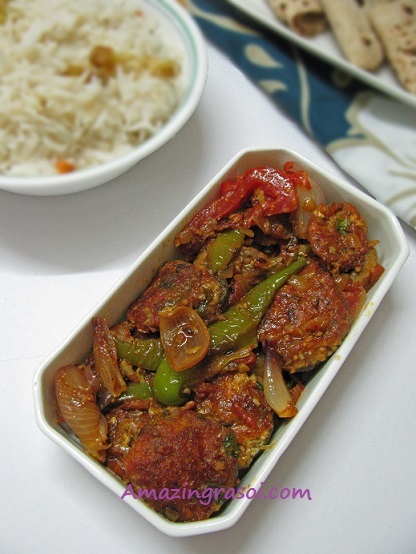 Stuffed Mushroom is always comes in top list among party appetizers. Since mushroom is Avi's favorite, I keep experimenting with mushrooms. This time I tried to give this party appetizer a new twist by preparing it as a main course. 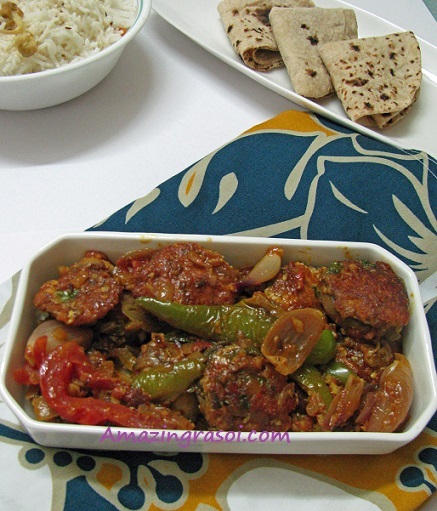 I added Stuffed Mushroom in jalfrezi gravy to make Stuffed Mushroom Jalfrezi. Clean and remove the steam of mushroom. Keep aside. For the stuffing heat oil in a pan and add finely chop garlic and green chillies and put in the pan and saute for few seconds then add the chop mushroom stems and add and saute for a 2-3 mins on medium heat. Transfer the mixture into a bowl and add the paneer, mozzarella cheese, onion, coriander leaves, white pepper pwd and mix well. Stuff the paneer mixture in each mushrooms as shown in pic. Heat 1-2 tbsp oil in non stick pan and arrange the stuffed mushrooms in it( as shown in pic). Cover and cook for 1-2 mins on high heat. Turn the mushroom and cook for 4-5 mins on low heat. Take out and keep aside. Heat oil in a pan and add capsicum and cook for 1/2 min on high heat then add onion and tomato and cook for another 1/2 min on medium heat. Turn of the heat. Heat oil in pan/kadai and add cumin seed, when they start splutter add chopped onion and ginger garlic past, cook until the onion turn light brown then add chopped tomato and all dry masala. Cook until oil start separating. Add the capsicum, onion and tomato which we have saute earlier and mix well. Add stuffed mushroom and mix with light hand. Make sure that they are well coated. turn off the heat. Sprinkle finely chopped coriander leaves and serve with roti/paratha/naan. Do not over cook the mushroom. 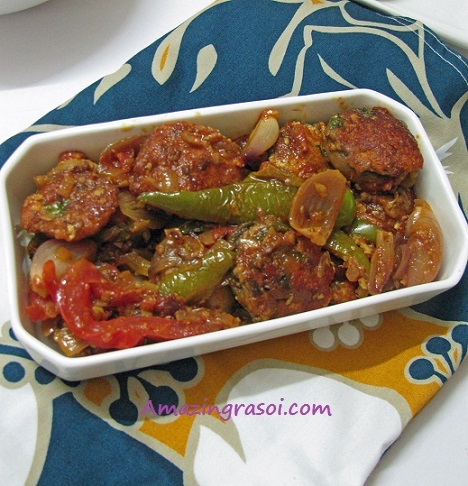 Mix stuffed mushroom in masala with light hand otherwise stuffing will come out.